Kathleen is able to present a number of talks and workshops. These are just a selection of the ones that she can teach and others are available on request. Kathleen has developed this relaxed friendly talk outlining her transition from hand worked embroidery into Machine Embroidered Organza. Explaining how she works & combines them into dimensional and structural art works. Kathleen explains how she has developed stitching and designing with flexible plastic. Using this to produce clothing, bags, art panels and wall hangings. This lecture will reveal how Kathleen came into textiles through her family upbringing. She will walk you through many textiles that few people know that she has or does do. Samples will be passed around as Kathleen leads you through her history of how she came to be passionate about all forms of textiles and what she now teaches with passion. In this talk, Kathleen will share with you, her passion and celebration of the sewing machine. Along with how you can produce stunning embroideries using only the humble sewing machine. Samples will be passed around as Kathleen talks about the techniques and her passion for using her sewing machine and the beautiful threads and media that make stunning simple and complex machine embroidered art works. 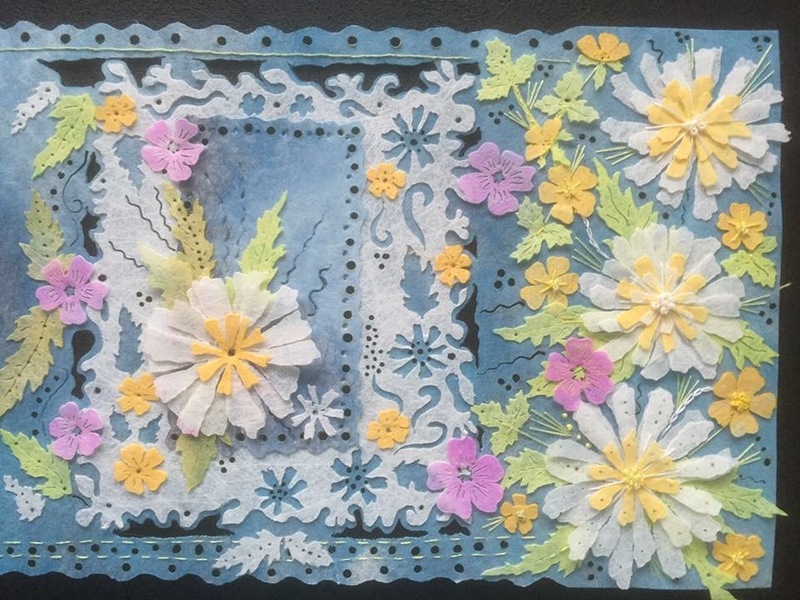 This is Kathleen’s signature workshop where she will guide you through her layering between water soluble, machine embroidery, reverse applique and using a soldering iron technique. To produce a see-through and lacy floral panel, giving you a full understanding of the process of techniques she uses throughout her work. 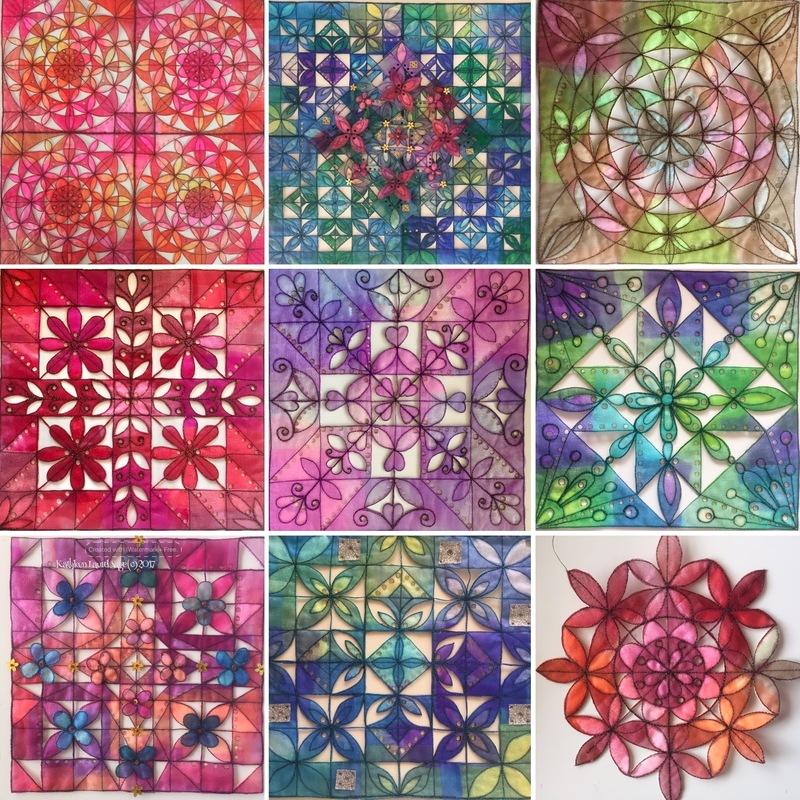 A 9″ x 9″ panel will be made during a day workshop. Larger projects can be designed and made across a residential weekend. A second workshop exploring tile patterns and patchwork blocks as a source for layered organza fabrics between water soluble film. These are machine stitched, reverse appliqued and then cut out and defined by using the soldering iron. 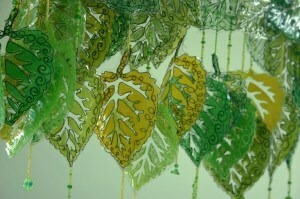 A course designed to explore how to be creative with flexible PVC plastic. This is where you will paint it, stamp it and layer it with all manner of bits and bobs to produce a small collection of individual textile art works. This will fire up your imagination and start you on a journey towards a new and innovative embroidery. 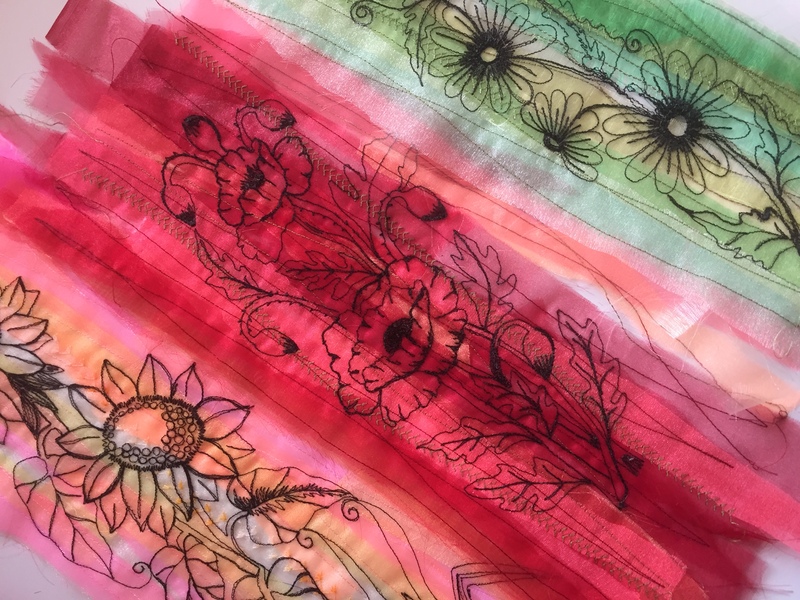 Create fabrics from layers of organza sketched together with floral designs. Your fabric will be constructed using water soluble film and your chosen design will be worked in free motion embroidery to link your fabrics together and create a delicate new and innovative fabric panel. A course designed to explore what can be done with this spun bound Vilene type product that excepts paints and dyes. it can be machined into, heat zapped and digressed, soldered, rolled and wired to give some amazing results. Spend the day and discover its secrets within your work. 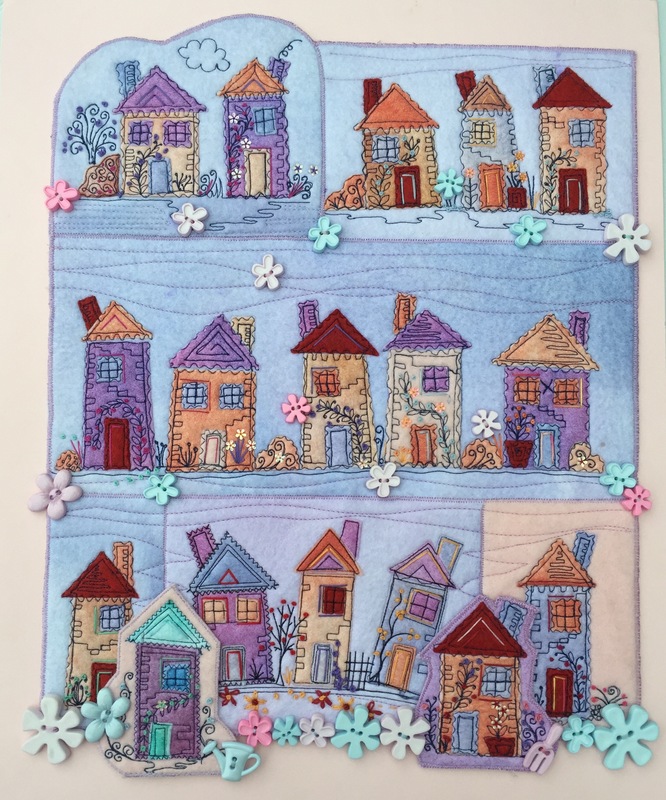 Have enormous fun designing and stitching these delightful little wonky houses. Made from dyed felt and wonky free motion stitching with and embroidered embellishments of beads and buttons. A real feel good workshop suitable for all. 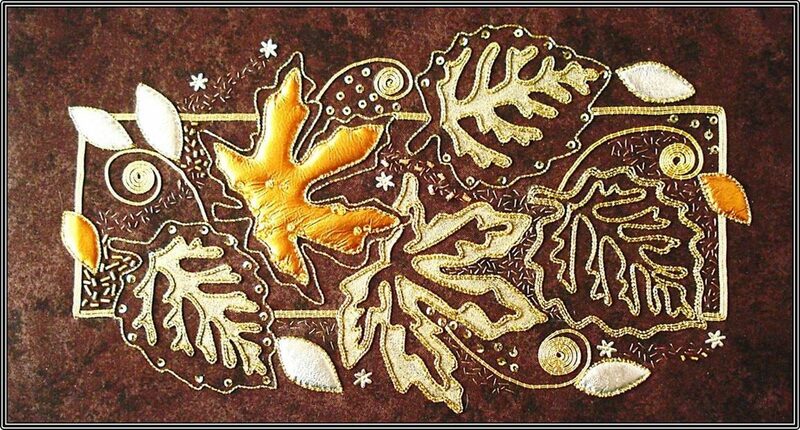 Learn how to couch cords, pad gold foiled leather and how to apply wires and purl to create glorious gold work embroidery with a modern twist. Technique or project based days with designs available to work. Learn the traditional techniques of raised and wired embroidery learning how to make organza dragon fly wings and how to wire leaves and petals to add relief to surface stitched background. If you would like to contact Kathleen about any of these talks or workshops, contact her here.